We now offer you the ability to receive weather related field updates through text messaging. Click here to sign up to receive text messages. On weekdays, ALL fields will be evaluated between 3:00 PM - 4:00 PM where rainfall is a factor in determining whether a field is playable or not. On Weekends, ALL fields will be evaluated between 7:00 AM - 8:00 AM (for morning games), around 12:00 PM (for afternoon games), and again between 3:00 PM - 4:00 PM (for evening games) where rainfall is a factor in determining whether a field is playable or not. Since games are played all day on weekends, it's possible that afternoon and evening games could still be playable. This information will be updated as needed. "..to implant firmly in the youth of our community the ideals of good sportsmanship, honesty, loyalty, courage and reverence. The objective will be achieved by providing a supervised baseball program. The attainment of exceptional skills or the winning of games shall be secondary to the prime goal of molding ethical young adults." The City of Ralston has asked us to keep the grass healthy as we open the fields this year. 1. That you warm up 15-20 feet off the foul lines ALWAYS. 2. That you change your directions each day. * * Tuesday, Thursday, Sunday: Warm up North and South. Click on the Storm Chaser Tickets link to the left to purchase your tickets today! You can also click on the image below for more information. 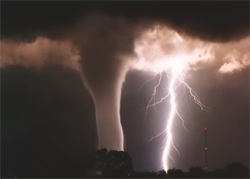 I'd like to bring to your attention that Severe Weather Season is approaching and as coaches, commissioners, parents, & board members, we need to be aware of what to do in the event that severe weather pops up rapidly while at the fields. For Pierson, Crown, & Wager: Take the teams to the nearest restroom building and take appropriate measures. For Meadows, Middle School, & RHS: We are still waiting to hear what the schools would recommend for each location. I know we all want to get games/practices in but do not put the kids at risk. 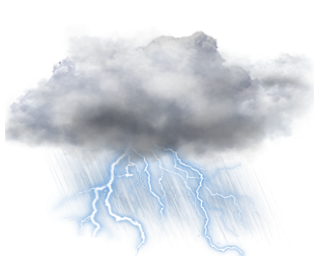 Umpires make the call for suspension of a game if lightning is in the area. If lightning is spotted, I would suggest that players go to their parent's cars and wait until play resumes or the game is called. If you are at Pierson, and there is enough time, tarp the mound and home plate only if there is sufficient time. Most of all, please make smart decision based on the safety of the kids, not the game. Thank you all for giving your time to all our players. Let's hope the rest of the season goes well and we can get the games in. Online Registrations for the 2019 RABA Baseball Season are complete. Thank you to all who have registered and for choosing the Ralston Area Baseball Association for Spring Baseball. We look forward to a very enjoyable season, and for your return for the 2020 season! Registrations for the 2019 Rams 16u and Rams 18u Leagues are CLOSED and FULL. We will no longer accept registrations for them. Sorry for any inconvenience this may have caused. Week of 3/25: Practices can begin given weather and field conditions. PENDING: Ralston Baseball @ Dicks Sporting Goods Day 20% off! Sunday, April 28th: Annual Bill Stekis Free Baseball clinic @ 3:30 Ameritrade, free game CU vs Xavier, registration at www.billsteckis.com is required. Week of April 15th: Mandatory team scrimmages. Memorial Day weekend observed Saturday - Monday. Games will be played Friday and resume Tuesday. 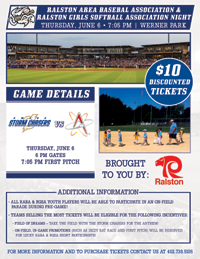 June 6th: Field of Dreams with the Storm Chasers. 250 tickets available at $10 each. Normally $17 each. July 8th: All Star Recreational championship for Mustang to Pony ages. RABA and LaVista Commissioners met in September and discussed the need to update the rules for both the Yearling and Mustang Leagues to make them more competitive at a recreational level during inner-league play. The rules will be posted as soon as they have been updated. RABA has placed a new sign or "Wall of Honor" at Pierson Field. The base of the sign will form the shape of a baseball and will be made up of three different sized pavers. The medium & large pavers will make up the outside ring of the base and the smaller pavers will make up the the rest of the base. We are taking donations for these pavers at a cost of $75 for the small pavers, $100 for the medium pavers, and $150 for the larger pavers. Included with the donation price is the engraving cost. The small pavers will have a maximum of 20	letters, the medium pavers will have a maximum of 25 letters, and the large pavers will have a maximum of 35 letters. If you are interested in donating you can do so by filling out the online form and pay using a credit card or print it out and mail it to the address at the bottom of the form. VP Recreation League ( Email Questions To ) at: vp_recreation@ralstonbaseball.org. VP Competitive League ( Email Questions To ) at: vp_competitive@ralstonbaseball.org. Click on sponsor's image below to visit their website. He pulls on a helmet, picks up the bat, and walks to the plate, "Gotta hit, and that's that!" The crowd starts to yell, the game's on the line, last inning, two outs, the score's nine to nine! Dad yells, "GO GET IT! ", and mom wrings her hands, coach hollers, "HIT IT! ", but alone there he stands. Heroes are made in seconds such as this, but he's just a little boy, what if he should miss? Years after this game's ended and he's little no more, will he remember the outcome or even the score? No, he'll have forgotten if he was out, hit, or a run, he'll only look back on his friends and the fun. So cheer this boy on, alone with his fate, help him remember with fondness this stand at the plate. Spend your time wisely and help in his quest to be a hitter with confidence and always his best. And when the game's over, this boy can stand tall, for you've helped him prepare to give it his all! -- taken from "You Can Teach Hitting"
Do you know the signs of a concussion?? Click on the image below for information on mandatory certification and useful tools that will help you to recognize the signs of a concussion. Things you should know before buying your child a bat for the 2019 season. Click on the image below for information on guidelines for purchasing a legal bat to use in youth baseball.